The Legendary venue that is King Tuts is tonight hosting a potential legend in the making. About a third of his way through his tour which began in Sheffield in February and will end in Hamburg in April John Lennon McCullagh brings his guitar, his harmonica and his bluesy voice to Glasgow. 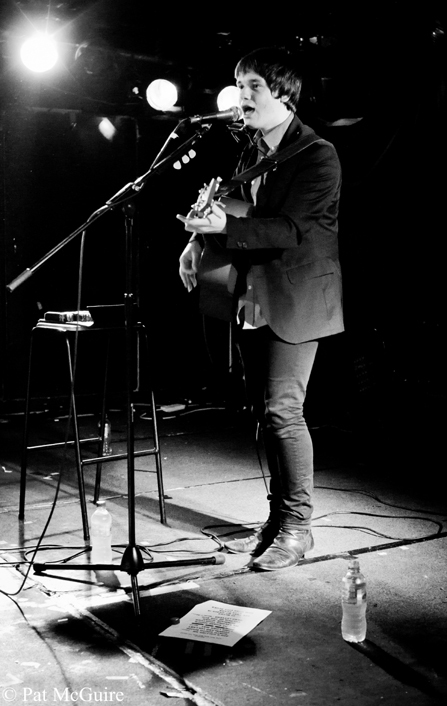 Signed to Alan McGee’s 359 Music label, and with his debut Album North South Divide released last October on Cherry Red Records, the young balladeer takes to the stage in a venue which has been the springboard for too many bands and artist to mention. If you are in doubt just look it up on the web, or, have a look at the stairs on the way from the bar to the stage and see the company he is about to become a part of. I’m not saying that lightly. 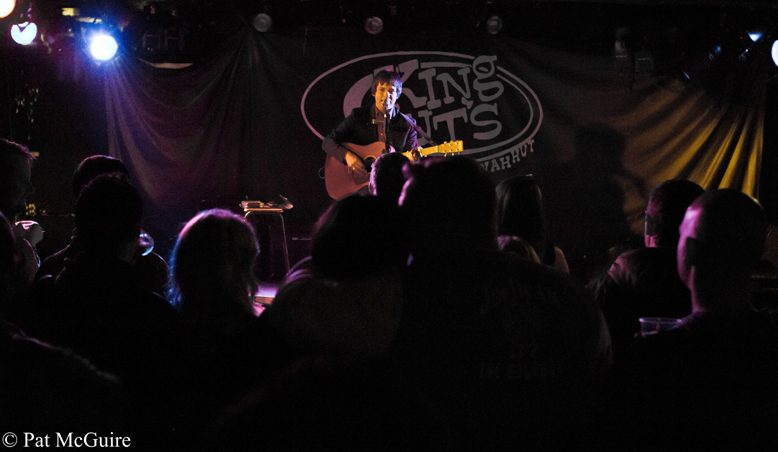 I’ve seen many bands at King Tuts, some went on to better things, and others didn’t. The fact that it is the kind of venue that people put on their list to play or to see bands at is the important thing here. For every band that gets success there will always be many that don’t. It’s not the easiest job in the world to be in a band, but if you get to do it as part of your life, it is perhaps one of the greatest. Before I start my review proper, I need to mention the support acts tonight. Michael Timmons opened the gig with some excellent electric guitar and vox to an appreciative crowd and was followed by Jamie Coleman with spirited acoustic playing and rousing tunes. Both of these guys are definitely worth seeing live ( I will try to see both acts soon so I can write about them as a full review ). But tonight I’m here to see John Lennon McCullagh and also to try to take some photographs. John Lennon McCullagh comes on stage and says hello to the crowd, then asks them to come closer to the stage. “Come on Glasgow, get nearer!” said with so much self assurance and confidence that everyone does just that. He is not cocky or brash, just setting the tone for the gig. And the tone itself is acoustic and bluesy and inclusive. He makes eye contact with people while he plays and sings his set, again not in a big headed pop/rock star way, more so as a guy who wants to play his music and include you in the experience. It’s not an act, it’s just the way he does his gigs. Lyrically his songs have a maturity that belies his actual years. “North South Divide” ( the title track from his Album ) has a depth in its poetry and message. “You’ll have a job at sixteen, it says so on the news. But as I look around, I see no jobs but dole queues.” Those words could be the anthem of teenagers from any post war decade to the present, maybe they should be the anthem of teenagers right now? Lyrical maturity is the key here. Paul Weller wrote “In the City” aged nineteen. When Bob Dylan arrived in Greenwich Village he was a teenager with a guitar and a harmonica. Both of them wrote songs that have defined their respective generations and also inspired people who followed. Both were also influenced respectively by Guthrie and Townsend. What I hear when I listen to John Lennon McCullagh is almost a Mod version of Dylan. That comment might come across as ill conceived or based in ignorance, but that is what I perceive from the songs in a general sense. There are other influences in play too some more obvious than others. However being influenced by people musically is one thing, taking that influence and making it your own is another. John Lennon McCullagh does that successfully as he adds his own take to his songs live and on his records. Back to the gig… The crowd are fantastic, receptive and involved. John Lennon McCullagh takes us all on a journey and even smiles at the guy at the back who shouts for “Free bird“. We are not getting Lynyrd Skynyrd covers tonight though, instead we get a set full of folksy blues with a modern lyrical bent. The genre he plays wouldn’t have been out of place in a club in the sixties but still sounds fresh and contemporary tonight in Glasgow. There is a talent at play here that combines the old with the new without sounding like a tribute act. The obvious comparisons that some people have made with Jake Bugg are missing the point on so many levels. Maybe to a younger crowd that is the only reference point and that is fair enough, but to me you could add Johnny Cash or Joe Strummer to the list easily, especially on “55 Blues”. For a sixteen year old to have such a wide scope of influences and still make the songs his own is both surprising and refreshing. 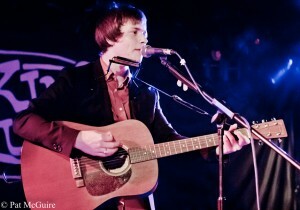 He is still on tour just now and has just been added to the bill on the main stage at the Bingly Live Music Festival. You should catch some of his shows this year if you want to see a real talent before he hits the big time. If only so you can say you were there at the start.